Patrick shares the top concerns of CEO’s world-wide and explains what they can do to remedy these problems. 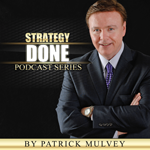 Patrick explains why most strategies fail and offers some simple rituals that you can use to assure your strategy is successful, by counter-intuitively making the complex easy. Patrick explains how to get your teammates emotionally attached to the organization’s overall objectives. Patrick shares the five deadly practices in goal setting.